The Smell of the Sheep: Knowing their pain and healing their wounds is at the core of the shepherd's task. The abuse of minors by ordained ministers has inflicted wounds not only on the victims, but also on their families, the clergy, the Church, the wider society, the perpetrators themselves and the Bishops. But, it is also true, we humbly and sorrowfully admit, that wounds have been inflicted by us bishops on the victims and in fact the entire body of Christ. Our lack of response to the suffering of victims, even to the point of rejecting them and covering up the scandal to protect perpetrators and the institution has injured our people, leaving a deep wound in our relationship with those we are sent to serve. People are rightly asking: “Have you, who are called to have the smell of the sheep upon you, not instead run away when you found the stench of the filth inflicted on children and vulnerable people you were supposed to protect, too strong to endure?” Wounds call for healing. But what does healing consist in? How do we as Bishops, who have been part of the wounding, now promote healing in this specific context? The theme of healing of wounds has been the subject of many inter-disciplinary studies. And I cannot pretend to know all the findings of the human and social sciences on the subject, but I believe we need to recover and maintain a faith and ecclesial perspective to guide us. I repeat: a faith and ecclesial perspective to guide us, as stressed many times by Pope Francis. For my presentation, specially the first part, I invite everyone to look to the Risen Lord and learn from Him, His disciples and their encounter. I want to acknowledge at this point the studies published by Roberto Goizueta, Richard Horsley, Barbara Reid, Tomas Halik, Robert Enright and Cardinal Albert Vanhoye, to name a few authors, who have helped me in my reflection. St. John´s Gospel narrates an apparition of the Risen Lord to the disciples on the evening of the first day of the week. The doors were locked as the disciples cowered in fear, wondering if they would be the next to be arrested and crucified. It is in this moment of utter helplessness that the risen and yet still wounded Jesus stands in their midst. After greeting them with the message of the resurrection, “Peace be with you,” He showed them His hands and His side, marked by gapping wounds. Only by drawing close to His wounds could they be sent on a mission of reconciliation 1 Studies published by Roberto Goizueta, Richard Horsley, Barbara Reid, Tomas Halik, Robert Enright and Cardinal Albert Vanhoye, to name a few authors, have helped me in my own reflection. Notice how Jesus invites them again to look at his wounds. He even insists that Thomas put his finger into the wounds of his hands and to bring his hand into the wound of his side. Try to imagine how Thomas must have felt. But from seeing the wounds of the Risen Lord, he makes the supreme profession of faith in Jesus as Lord and God. Seeing and touching the wounds of Jesus are fundamental to the act and confession of faith. What can we learn from this intimate encounter? By repeating this action twice, the evangelist makes clear that those who are sent to proclaim the core of our Christian faith, the dying and rising of Christ, can only do so with authenticity if they are constantly in touch with the wounds of humanity. That is one of the marks of our ministry. This is true of Thomas, and it is true of the Church of all time, especially in our time. Msgr. Tomas Halik writes, “Christ comes to him, to Thomas, and shows him His wounds. This means that the resurrection is not the ´effacement´ or devaluation of the cross. Wounds remain wounds.” The wounds of Christ remain in the wounds of our world. And Msgr. Halik adds, “Our world is full of wounds. It is my conviction that those who close their eyes to the wounds in our world have no right to say, ´My Lord and my God´.” For him, seeing and touching the wounds of Christ in the wounds of humanity is a condition for authentic faith. He further says, “I cannot believe until I touch the wounds, the suffering of the world – for all the painful wounds, all the misery of the world and of humankind are Christ´s wounds! I do not have the right to confess God unless I take seriously my neighbor´s pain. Faith that would like to close its eyes to people´s suffering is just an illusion.” Faith is born and reborn only from the wounds of the Crucified and Risen Christ seen and touched in the wounds of humankind. Only a wounded faith is credible (Halik). How can we profess faith in Christ when we close our eyes to all the wounds inflicted by abuse? Brothers and sisters, this is what is at stake at this moment of crisis brought about by the abuse of children and our poor handling of these crimes. Our people need us to draw close to their wounds and acknowledge our faults if we are to give authentic and credible witness to our faith in the Resurrection. This means that each of us and our brothers and sisters at home must take personal responsibility for bringing healing to this wound in the Body of Christ and make the commitment to do everything in our power and capacity to see that children are safe, are cared for in our communities. The presence of the wounds of the crucifixion on the Risen Lord, for me, defies human logic. If the world were in-charge of choreographing the resurrection, Jesus would have showed up at Herod’s house or Pilate’s porch and made it the biggest “I told you so,” in history. Jesus would have manifested his final triumph by eliminating all signs of pain, injustice and defeat. Let all of them be buried in the dark past and never be resurrected. But that is not the way of Jesus Christ. The resurrection is not an illusionary victory. By showing his wounds to the disciples, Jesus restores their memory. Roberto Goizueta justly comments that “the wounds on Christ´s glorified body are the incarnated memory of the relationships that defined his life and death.” The wounds of Jesus are the consequence of his loving and compassionate relationship with the poor, the sick, tax collectors, women of ill repute, persons afflicted with leprosy, noisy children, outsiders and foreigners. The wounds of Jesus are the consequence of his allowing himself to be wounded as he touched the wounds of others. He was crucified because he loved these concrete persons who were themselves wounded by society and religion. By sharing in their weakness and wounds, he became a compassionate brother rather than a harsh judge. So the letter to the Hebrews 5:8-9 affirms, “Son though he was, he learned obedience from what he suffered, and when he was made perfect, he became the source of eternal salvation for all who obey him.” So the wounds of the Risen Lord remind the disciples of the love that is ready to be wounded out of compassion for humankind. His wounds are the wounds of others that he freely bore. He did not inflict wounds on others, but he was ready to be wounded by his love for and communion with them. Only the wounds of love and compassion can heal. My dear brothers and sisters, we need to put aside any hesitation to draw close to the wounds of our people out of fear of being wounded ourselves. Yes, much of the wounds we will suffer are part of the restoration of memory we must undergo, as did those disciples of Jesus. The wounds of the Risen Lord reminded the disciples of betrayal, their own betrayal and abandonment of Jesus when they saved their own lives out of fear. They fled at the first moment of danger, afraid of the cost of discipleship, and in Peter’s case, even denying that he even knew the Lord. Jesus’ wounds also remind them and us that wounds are often inflicted by blindness of ambition and legalism and misuse of power that condemned an innocent person to die as a criminal. The wounds of the Risen Christ carry the memory of innocent suffering, but they also carry the memory of our weakness and sinfulness. If we want to be agents of healing let us reject any tendency that is part of worldly thinking that refuses to see and touch the wounds of others, which are Christ´s wounds in the wounded people. Those wounded by abuse and the scandal need us to be strong in faith in this moment. The world needs authentic witnesses to the resurrection of Jesus, who draw close to His wounds as the first act of faith. I will be stressing: this is an act of faith. Roberto Goizueta claims that the denial of wounds and death leads to the death of others and to our own death. There is great fear today in the hearts of people and indeed in our own hearts, that cause humanity in our time to shun touching the wounds in our world simply because we are afraid of facing our own wounds, our own mortality, weakness, sinfulness and vulnerability. Ernest Becker observes that we avoid pain and suffering as unwanted reminders that we are vulnerable. We are fooled into believing that having much money, the right insurance policy, the strictest security, Cctv cameras, the latest model of cars and gadgets and membership in rejuvenating health clubs could make us immortal. Sadly we do also eliminate the wounded in our midst by getting them out of the streets when dignitaries visit or by covering their shanties with painted walls. Goizueta poignantly says, “If we deny death, we inflict it. If we deny death, we will inflict death. But we also inflict it on ourselves. The fear of pain and vulnerability that causes us to shun real human relationships, to shun that true love that always involves surrender and vulnerability in the face of another, ultimately kills our – our! – Interior life, our ability to feel anything – neither pain nor joy, nor love.” Our capacity to love might die. The fear of wounds isolates us and makes us indifferent to the needs of others. Fear drives people to violent and irrational behavior. Fear motivates people to defend themselves even when no threats exist. Those who sow fear in others and society are actually afraid of themselves. In the Risen Jesus we know that by seeing and touching the wounds of those who suffer, we touch our own wounds and we touch Jesus. We become brothers and sisters to one another. We acknowledge our common guilt in inflicting wounds on humankind and creation. We hear the call to reconciliation. We see the patient presence of the Risen Lord in our broken world. About the second and last part of my sharing: a psychologist proposal in the light of faith; in the light of faith, and a psychologist proposal. For this portion I will rely heavily on dr. Robert Enright, professor at the University of Wisconsin-Madison in the United States, and the pioneer in the social scientific study of forgiveness. We are collaborating with him on the programme of forgiveness in the Philippines. In fact, in this very moment there is a session among Catholic School Educators in Manila on “Pain, wound and forgiveness”. According to him, one concern that we must address is: Once justice is served, how do we help the victims to heal from the effects of the abuse? Justice is necessary but by itself does not heal the broken human heart. If we are to serve the victims and all those wounded by the crisis, we need to take seriously their wound of resentment and pain and the need for healing. Resentment can be like a disease, that slowly and steadily infects people, until their enthusiasm and energy are gone. With increasing stress, they are prone to heightened anxiety and depression, lowered-self-images, and interpersonal conflicts that arise from the inner brokenness. Yet, before we even raise the issue of asking the victims to forgive as part of their healing, we must clarify that we are not suggesting that they should just let it all go, excuse the abuse, just move on. No. Far from it. Without question, we know that when victims come to a moment of forgiving others who have harmed them, a deeper healing takes place and the understandable resentments that build up in their hearts are reconciled. We know that forgiveness is one powerful and even scientifically supported pathway for eliminating pain, resentment and the human heart. We as the Church should continue to walk with those profoundly wounded by abuse building trust, providing unconditional love, and repeatedly asking for forgiveness in the full recognition that we do not deserve that forgiveness in the order of justice but can only receive it when it is bestowed as gift and grace in the process of healing. Finally, we are concerned that in some cases bishops and religious superiors are tempted--- perhaps even at times pressured----to choose between victim and perpetrator. Who should we be helping? Who should be helped? Now, a focus on justice and forgiveness shows us the answer: We focus on both. Regarding victims, we need to help them to express their deep hurts and to heal from them. Regarding the perpetrators, we need to serve justice, help them to face the truth without rationalization, and at the same time not neglect their inner world, their own wounds. At times, we are tempted to think in “either/or” terms: We strive either for justice or we try to offer forgiveness. We need a shift to a “both/and” stance as we deliberately ask these questions: How can we serve justice and foster forgiveness in the face of this wound of sexual abuse? How can we prevent distorting forgiveness so that we do not equate it with just letting the injustice slide away or move on and dismiss the wrong? How can we keep an accurate view of forgiveness as offering a startling mercy of unconditional love to those who have done wrong, while at the same time, we strive for justice? How can we renew the Church by a firm correction of a definite wrong and walk with the abused, patiently and repeatedly begging forgiveness, knowing that giving such a gift can heal them even more? I am writing to you again to seek the truth whether you gave consent to the reinstatement of Lio Rotor to priesthood or not. Sometime in September 2017, I asked you specifically in my email – if Bishop Dunn consulted you prior to Rotor’s reinstatement, and if you eventually approved the reinstatement. You, however, wrote me a letter saying, “So far as I know, Bishop Patrick Dunn of the Diocese of Auckland, New Zealand initiated the process of Fr. Rotor’s reinstatement and followed it through.”What you said in your letter gave me an impression that you were not obviously consulted by Bishop Dunn at all. I have asked Bishop Dunn numerous times via email and over the phone if he contacted you prior to the reinstatement. I also asked him if the Archdiocese of Manila consented to it. He had no answers to these questions giving me the impression that he did not involve you in this matter. Now, on March 11, 2018, an article written by Mr. Tony Wall with the title – “Catholic priest defrocked after affair in the US now in charge of Auckland parish”, was published in istuff.com. In the article, Bishop Dunn stated that, “he got in touch with the Cardinals in Manila, who had no objections” on the reinstatement. 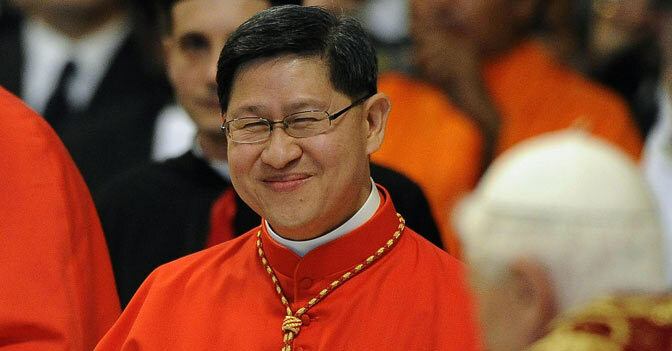 Obviously, the cardinals he was referring to were Cardinal Gaudencio Rosales, and you, Your Eminence. So who is telling the truth now? If indeed Bishop Patrick Dunn got in touch with you and you had no objections to Rotor’s reinstatement to priesthood, then you are the one who is not telling the truth. Your Eminence, I hope you are not the one lying. You were once considered a papabile; you are currently the president of Caritas Internationalis; and you are the archbishop of the Archdiocese of Manila. On the other hand, if you were not consulted at all, then Bishop Dunn is the liar. I won’t expect that he would lie too because he is the president of the Bishops Conference of New Zealand, and the bishop of the Diocese of Auckland. Please clarify and tell me the real story, Cardinal Chito.